Product categories of POE+ Switch, we are specialized manufacturers from China, POE+ Switch, 4 Port POE Switch suppliers/factory, wholesale high-quality products of 4 Ports POE Ethernet Switch R & D and manufacturing, we have the perfect after-sales service and technical support. Look forward to your cooperation! 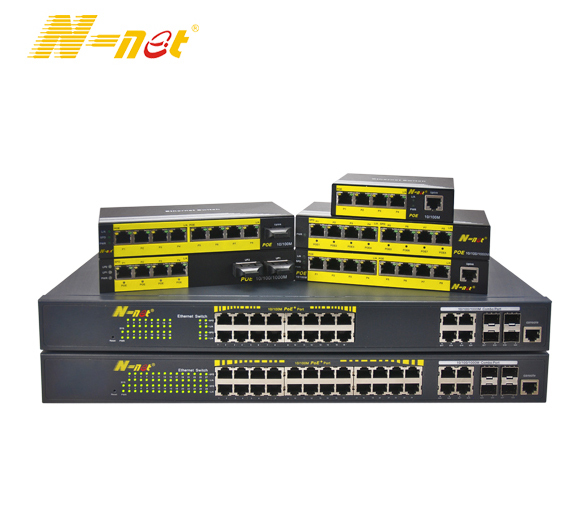 N-net POE+ Switch series is widely used in the indoor CCTV projects. This series is cost effective and ideal for smaller networking needs. Choose from a wide variety of 10/100 and Gigabit Ethernet models , desktop or rack-mount form factors. Power Over Ethernet makes network device installation simpler, safer, and less expensive. Whether you're deploying a network of IP Cameras, Wireless APs, IP phones, or any other PoE device, N-net PoE switches will provide the flexibility, simplicity, safety and cost savings you need for a successful installation. N-net POE Switch series support IEEE802.3 af/at standard, up to 30W PoE output per port. In this series included unmanaged, smart and managed PoE switches. Unmanaged PoE switches are considered a mainstay of IP surveillance networks because they are low-cost, easy-to-use and good for simple connectivity. However, more and more security professionals are beginning to realize the tremendous benefits of upgrading to Smart (managed) PoE switches. Not only do they represent minimal cost increases, they provide network administrators with a simple, easy-to-use interface through which the IP surveillance network can be configured and monitored from anywhere, anytime. They also offer additional tools that enable administrators to enjoy faster network installation, easier network maintenance and upgrades, and better visibility into network health. It all adds up to time- and cost-savings that are attractive selling features for today`s budget-conscious organizations.